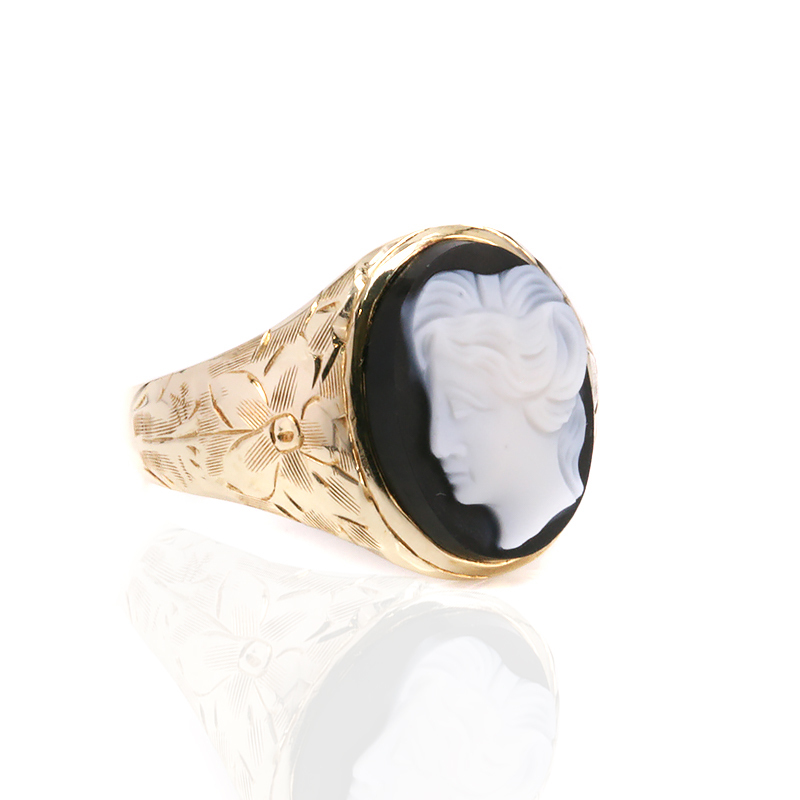 Product code: ES8239 Categories: Antique, Antique Cameo, Antique Rings. Cameos are often carved from shell which is a relatively soft material, whereas this cameo was hand carved from onyx which is from the quartz family and much more stronger and also much harder to carve and was left to the best of the best carvers. 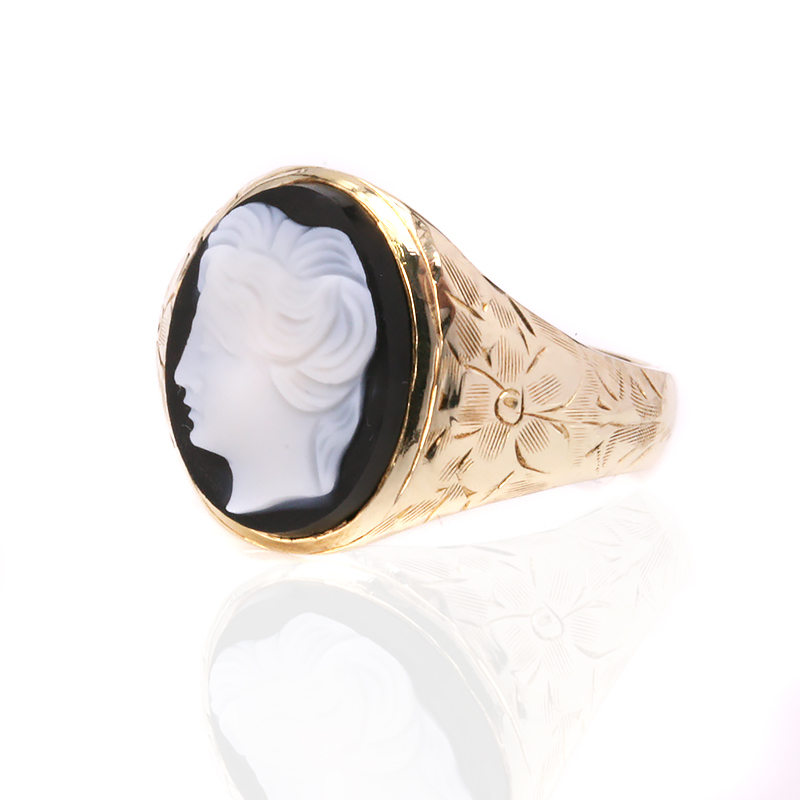 Carved from onyx which is naturally layered black and white, this antique cameo ring depicts a woman’s head in profile and was so exquisitely hand carved with fantastic attention to detail. The black and white colouring of the onyx really makes the cameo stand out and the cameo measures 16.7mm by 12.3mm. Dating from the 1880’s, the ring was made in 15 carat gold and not only do the sides taper down so elegantly, but they also display the most wonderful hand engraving that accentuates the ring as a whole and makes it even more feminine. With a lovely tactile feel to both the cameo and the band, this is a wonderful example of a late Victorian antique cameo ring that shows the quality of craftsmanship from all those years ago. Tags: Antique cameo ring, Cameo.